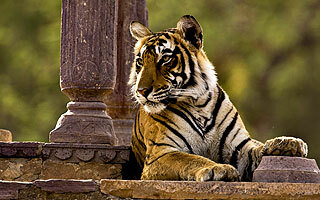 Experience the charm of Delhi, Agra & Jaipur along with the thrill of Rajasthan wildlife in your awesome Golden Triangle Tour with Rajasthan Wildlife Package. You will get an aopportunity to visit beautiful cities and experience elephant safari, camel ride & Wildlife Jeep safari in this tour. Your specially designed tour will give you a chance to see some of the rare and fascinating wild animals like Tigers, Siberian cranes, wild boar and much more. It's our pleasure to meet with you in your first footstep to incredible India. Representative of Plan Our Travel's will warmly welcome to the country with heartfelt hospitality at the airport. Then, transfer to the hotel. On the arrival at hotel, check-in and after freshen up proceeds for the sightseeing of Delhi. 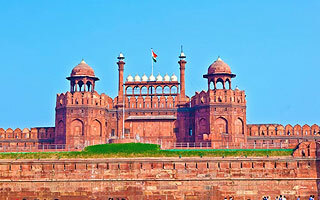 Delhi is the capital of India and the most popular holiday destination in the northern India. The metropolitan city is the ideal place to enjoy luxury vacation in a most entertaining way. Places of tourist interest in the city are India Gate, Qutub Minar, Red Fort, Purana Qila and Lotus Temple. Enjoy shopping at local bazaars namely Sarojini Market, Connaught Place, Chandni Chowk and Karol bagh. Morning after breakfast drive to Bharatpur En route visit city of Taj Mahal -Agra. After the glimpse of Taj continue your drive to Bharatpur. On arrival check into the Hotel & enjoy your evening relaxing at hotel. Bharatpur is known for its migratory bird Siberian cranes that throng the sanctuary in winters every year in search of food and warm weather. Overnight at Bharatpur. Morning after breakfast leave for Ranthambore, on ariival Ranthmbore check into the hotel. Post lunch you can go for an evening safari in the wildlife sanctuary. You may get to see tiger, leopard, jackal, hyena, sloth bear, python, crocodile, cobra, Indian roller bird, Bonelli's eagle, Crested hawk eagle, Great Partridge, king vulture, Golden-woodpecker and much more. Morning after breakfast you can do a morning and an evening safari in the game drive to see the Indian national animal (tiger) in its natural surroundings. After morning breakfast, check-out from the hotel and drive towards Jaipur. On arrival at Jaipur, check-in to the hotel and relax for a few hours. After freshen up proceeds for Jaipur Sightseeing. Jaipur is known as the pink city and capital of Rajasthan (India's largest state). Every nook and corner of the city offer special features that will surely hypnotize your attention. Hawa Mahal is a palace, constructed with unbelievable architectural design. It is also popular as Wind Palace and featured multiple elegantly carved doors and windows. Morning after breakfast drive towards the city of Delhi. On the arrival at Delhi, our friendly representative will transfer to airport to catch flight for your hometown. Here your golden triangle tour ends and sure that you enjoyed the tour lavishly. Happy fly!! !